Gainsville, Florida, is 3,019 miles away from where I sit as I write this. And it seems at least 3,000 miles away spiritually, at least in the kind of spirituality promoted by a certain "Christian" pastor there, who we'll leave unnamed. I was thinking earlier about what to post on this loaded date, nine years after the attacks by terrorists in Washington DC, New York, and Pennsylvania. I could post music showing the peaceful side of Islam, or something about the folly of the misguided rush to war that followed 9/11. Instead I baked oatmeal cookies. A lot of oatmeal cookies. 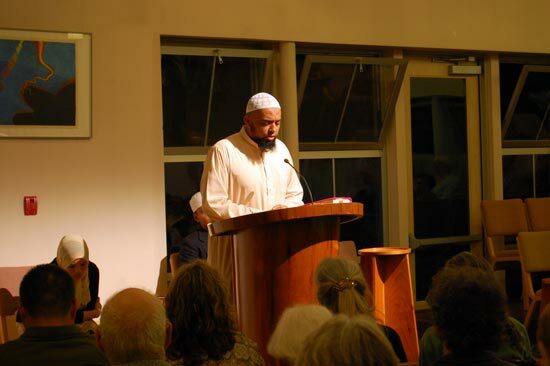 And then I went to a local interfaith event billed as "An interfaith response to anti-Islamic hate." My community has some strong interfaith credentials, with the roots of the most prominent interfaith organization dating back to 1969. So I wasn't surprised to hear about this event, a response to the Florida flare-up and a positive, neighborly way to observe the anniversary of a dark day. Though I was a little surprised to arrive near the Unitarian Universalist congregation where the event was being held -- in a quiet residential neighborhood -- and find so many cars there I had to park two blocks away. The place was packed. I recognized some faces, and learned who others were as they spoke. The main portion of the program was in the hands of local Muslims, who talked about the Quran, aspects of faith, and how some Arabs were essentially going back to pre-Islamic traditions of vengeful violence, which find no support in Islam. The new Imam of the local mosque, a Moroccan, was charming and self-effacing, and recited beautifully a passage from the Quran, with others translating. Equally moving were the comments by other local faith community leaders. One after another, Christians, Jews, Bahais, Buddhists, and others stood to support local Muslims and denounce intolerance, violence, and "them vs. us"-ness. And it wasn't just the rabbis and ministers and monks. As I mentioned, the place was packed. Which meant that here, more than three thousand miles away from this week's center of controversy, we had a gathering of two or three times more people than are members in that tiny Gainsville church. I can only imagine what kind of gatherings happened in larger cities around the USA. And I hope Muslims abroad will see some images of these kind of gatherings, and realize that most Americans do not hate them, and do not wish to desecrate their scriptures. Instead we want to live in a world where people of faith (and even of no particular faith) can share the qualities of respect, tolerance, gratitude, and compassion. We want to live in a world where a tiny message of hate cannot be louder than the voices of the many seeking peace. Every religion, every nation has its crazies. It's up to the rest of us to not allow them to set the agenda for everyone. I suppose that's my 9/11 message. Goes well with oatmeal cookies. Thanks for sharing your experiences from Saturday. I know that the peaceful minded individuals far outnumber the crazies. Unfortunately the latter gets most of the press. Here's hoping that humility and compromise guide our future.